You’ve done your research and learned all about the gluten-free lifestyle. So what do you do now? Knowing you have a gluten intolerance ? or worse, Celiac Disease ? is only half the battle. It’s time to implement this new knowledge into your daily life and that involves changing how you eat. If you’re like most people, coming up with new meal ideas can be challenging, especially if you’re limited with what ingredients you use. That’s why gluten-free cookbooks have become so popular: they take all of the guesswork out of cooking for you. Below are five popular gluten-free cookbooks that are favorites on the market right now. This book gets 5 stars on Amazon.com, with approximately 1,500 people offering up their opinion. Not only does the author offer gluten-free recipes, but she also works to keep dairy out of her diet as well. Another positive of this book is that it has a special children’s section, with creative ideas for the little ones in your life who are also going gluten-free. A favorite recipe stated by many is the Slow Cooker Sesame Orange Chicken. This book has plenty of 4.5 star reviews on Amazon.com, with over 200 people putting in their two cents. There are 100 recipes that do not include gluten and many people stated they are “great and uncomplicated.” It also helps you understand gluten and know how to read food labels. A featured recipe to look for is the Apple Crepes. So many kids are picky eaters to begin with. Taking gluten away from them can be pretty difficult. Luckily, this book contains 85 kid-friendly, gluten-free recipes. With 4.5 stars and almost 50 reviews, people like this book because it’s split up into six easy-to-read sections with ideas for breakfast, dinner, parties and desserts. Many reviewers stated it’s good for “starter” cooks as well. A recipe the kids will love is egg omelets in muffin pans. This book contains about 150 recipes for gluten-free baking that doesn’t involve wheat flour. The great thing about this book is it tells you why certain flours work better together, so your gluten-free items will still look and taste as great as their gluten-filled counterparts. It has 4.5 stars on Amazon.com, with almost 40 reviews ? many stating that a benefit of this publication over others is that it tells you the importance of weighing your flour instead of just measuring it. With 4.5 stars and 30 reviews, this book not only contains gluten-free recipes, but many vegan, vegetarian and even nut options as well. 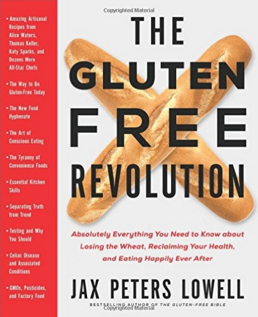 People who’ve read it state that it’s a very balanced book – that you don’t just learn about cooking, but about yoga, dance, Pilates and meditation (as part of the gluten-free lifestyle) as well. Once you get your hands on a copy, try the Rainbow Quinoa Salad.